Get outdoors at Safaris and Scuba & Snorkeling. To see traveler tips, other places to visit, maps, and other tourist information, you can read our Port Douglas driving holiday planner . Orlando, USA to Port Douglas is an approximately 32-hour flight. Due to the time zone difference, you'll lose 15 hours traveling from Orlando to Port Douglas. Prepare for somewhat warmer weather when traveling from Orlando in December: high temperatures in Port Douglas hover around 88°F and lows are around 73°F. You will leave for Uluru-Kata Tjuta National Park on the 31st (Tue). Step out of the city life by going to Valley of the Winds and Walpa Gorge. There's lots more to do: take your sightseeing to a higher altitude at Kata Tjuta, explore the galleries of Walkatjara Art, get engrossed in the history at Uluru-Kata Tjuta Cultural Centre, and stroll through Kuniya Walk. For where to stay, more things to do, photos, and more tourist information, read our Uluru-Kata Tjuta National Park day trip planning tool . Getting from Port Douglas to Uluru-Kata Tjuta National Park by combination of shuttle and flight takes about 6 hours. Other options: drive. Traveling from Port Douglas in January, expect nights in Uluru-Kata Tjuta National Park to be about the same, around 73°F, while days are somewhat warmer, around 99°F. Finish your sightseeing early on the 3rd (Fri) to allow enough time to travel to Manly. Visit Palm Beach and Bilgola Beach for some beach relaxation. Take a break from the city and head to Balmoral Beach, Mosman and Taronga Zoo. Explore the numerous day-trip ideas around Manly: Barrenjoey Lighthouse (in Palm Beach) and Ingleside (Baha'i House of Worship & The Baha'i Temple). There's much more to do: steep yourself in history at Manly Quarantine Station, explore the galleries of Joel Coleman Gallery, pause for some serene contemplation at Manly Freshwater Parish, and stroll through Shelly Beach. For ratings, more things to do, where to stay, and more tourist information, read Manly travel route planner . Traveling by combination of flight and ferry from Uluru-Kata Tjuta National Park to Manly takes 4.5 hours. Alternatively, you can drive. 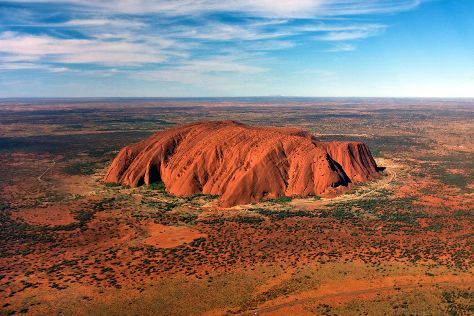 Prepare for slightly colder weather when traveling from Uluru-Kata Tjuta National Park in January: high temperatures in Manly hover around 81°F and lows are around 68°F. You will have some time to spend on the 7th (Tue) before leaving for home.